As mentioned, I loved Patrick Rothfuss’ first instalment in the Kingkiller Chronicles, The Name of The Wind, and while I devoured this one just as fast, it was far more tedious. For starters, and I guess this is somewhat of a spoiler alert, by the end of this book you still don’t know why Kvothe is expelled from the University! This review is going to be short because it is just more of the same. Kvothe has no money, he makes money as a talented musician and trough luck, he finds Denna, she runs away, he finds her, she runs away, etc. Kvothe does take a break from the University (He is arrested for pranks played on Ambrose but rather than being expelled is given a tuition he cannot pay), and takes up service with the Maer of a neighbouring town helping him procure a wife. Rothfuss does introduce the reader to new lands and therefore new characters, cultures, religions, and even mythical characters. You learn a bit more about the Fae, the culture that Bast belongs too. If you love fantasy, you’ll like this book. As with most other second books in a trilogy however, it felt like this novel was being written simply as a lead up to whatever is going to happen in the last installment. I will give Rothfuss this, I have no idea how he plans on ending this; there are so many directions he could take. Unfortunately there is still not publication date set, so the Kingkiller Chronicles becomes just another fantasy series to play the wait game with. This entry was posted in Reviews and tagged Fantasy, Fiction, Kingkiller Chronicles, Novel, Patrick Rothfuss, Review, Wise Man's Fear on February 18, 2016 by kwils3. Aside from Game of Thrones, I don’t find that I read that many books that can be classified as Fantasy. I had this recommended to me by a friend though, and while I was a bit unsue at first (Fantasy books tend to be enormous), I’m so glad I read it. 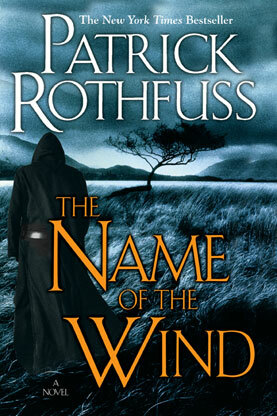 While I tend to think of all Fantasy as being the same, battles with mystical creatures much like Lord of the Rings, etc, Rothfuss’ The Name of the Wind proved to be something else entirely. It’s a bit strange actually, nothing really happens in this books, the first installment of a trilogy, and yet I was totally drawn in and compelled to keep reading. We meet Kote, an innkeeper in a small town and learn that he is the fabled Kingkiller, one responsible for staring the current war, in hiding. He meets a scribe who wants to write down his story so Kote begins to relate his ubringing, the loss of his parents, and then his time spent at the University, which takes up the majority of the book. The University is like Hogwarts but a bit less fantastical. Kote, or Kovothe as he was then known, studies to be an arcanist learning the rules which govern sympathy, which is essentially a very specific type of magic. It’s hard to explain here, but Rothfuss does a good job in the novel. Kvothe’s goal is to learn the name of the wind and thus exercise power over it. Along the way Kvothe makes friends, and enemies, and well as tries to win the heart of Denna, a girl impossible to pin down, while trying to find out what he can about the mythical Chandrian who killed his parents. The book ends, as I said, without many events occurring or any kind of dramatic climax, but it is clear that Rothfuss is setting the stage for the next two books. I have already started reading the second installment and hoping that there isn’t too long of a wait for the third. This entry was posted in Reviews and tagged Fantasy, Fiction, Kingkiller, Kingkiller Chronicles, Magic, Novel, Patrick Rothfuss, Review, The Name of The Wind, University on September 18, 2015 by kwils3.